National Health Mission CG NHM Raipur issued notification for recruitment of 128 different posts under CG NHM Raipur recruitment. All qualified and interested applicants can apply online mode before the last date ie 14-09-2018. The following papers are given below: at the meesevats.in, admissions, important links, courses, cards, results like education qualification, age limit, selection process, application fee and how to apply. 1. Program Contributor - 02 post. 2. OT Technician - 03 posts. 3. Second ANM - 34 posts. 4. Consultant - 04 post. 5.Block Account Manager - 01 post. 6. Nursing Officer - 36 posts. 7. AYUSH Medical Officer - Female (Medical Officer AYUSH-Woman) - 02 posts. 8. Pharmacist - 02 post. 9. ANM - 03 posts. 10. Speech therapist with Audiologist - 01 post. 11. Technical Assistant - 01 post. 12. Laboratory technician - 08 posts. 13. Junior Secretariat Assistant - 07 posts. 14. Cold chain and logistics assistant - 03 posts. 16. Data entry operator with accounting (data entry operator with accountant) - 03 posts. 17. Medical Assistant - 04 post. Applicants will be required to pass Degree / Diploma / Pharmacy / BSc Nursing / GNM in diploma / undergraduate degree / related subject / field from accredited organization / board in the 5th pass / 12th pass. For post 1 - 30000 / - monthly contract salary. Post 2, 12 - 14000 / - For monthly contract salary. For post 3, 4, 9, 13, 14 and 17 - 12000 / - monthly contract salary. For post 5 - 21000 / - monthly contract salary. For post 6, 8 - 16500 / - For monthly contract salary. For post 7 - 25000 / - monthly contract salary. For post 10 - 26250 / - monthly contract salary. For post 11 - 15000 / - For monthly contract salary. For 15 posts - 10000 / - monthly contract salary. For 16 posts - Rs. 13650 / - monthly contract salary. Look around for "CG NHM Raipur recruitment 2018" for various posts. 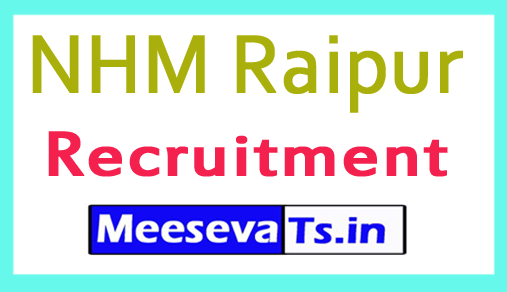 Look for "NHM Raipur Recruitment 2018 for Computer Assistant, Publications by Block Data Manager".